You will find Resonance operating everywhere as a basic principle of the Universe. Tesla's achievements mostly involved this principle. AC electrical generation was simply the combination of resonance with electron flow in wires, at 60 cycles per second. Its structure is similar to what musicians know as a "triad chord". We take it for granted now, but at the time (1888) it was a huge step forward for all humanity. Tesla obviously understood the principles of Resonance well -- this can often be found in his patent documents & drawings. Recently, many researchers have agreed that a wave form often described by Tesla in his patents be called "Tesla Waves". Previously there had been several names used by a number of scientists. These resemble sound waves more than any other known phenomenon. It appears that these waves precede electricity and gravity in many cases. One could say that music is more like the way our universe works than anything else we know. Any study of acoustics and/or music theory will thus be beneficial in understanding many other areas of science. Throughout most of European and American history the idea that studying music is beneficial for all students was embedded in educational practice. Only in the past 50 years has this idea been mostly abandoned in America, with poor results. In recent years the scope of music has been greatly altered by the introduction of electronic music. Now, tones can be custom shaped for any purpose. A whole new category of musicians has apperared: Tone Colorists, who specialize in shaping musical tones. Performance by South New Jersey band Tagg, Philadelphia July, 2009. He's playing the electric guitar and Theremin simultaneously. We can learn a lot from the way our human bodies were created. The resemblance here is no accident, and it works well. 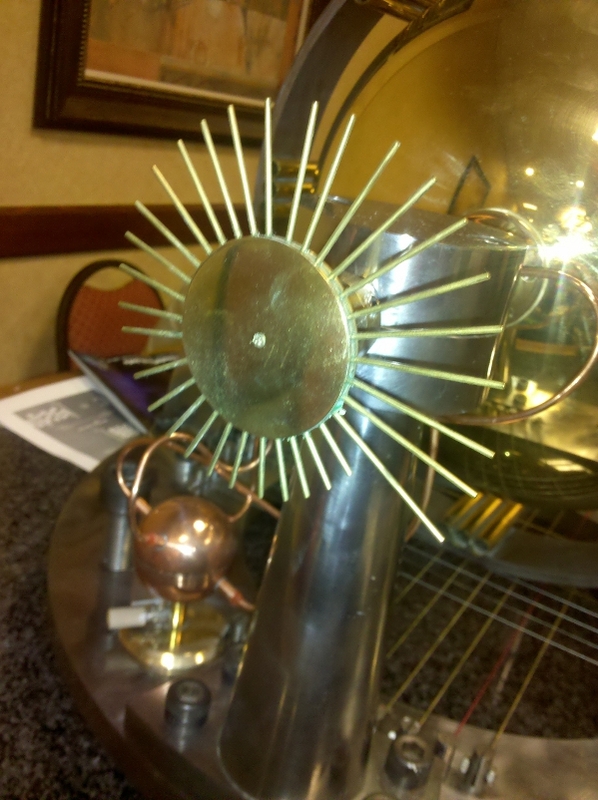 This is a "Back-Loaded Exponential Horn" speaker exhibited by Peter Fletcher-Haynes at the 2010 Vintage Voltage show.